The young artist at work. 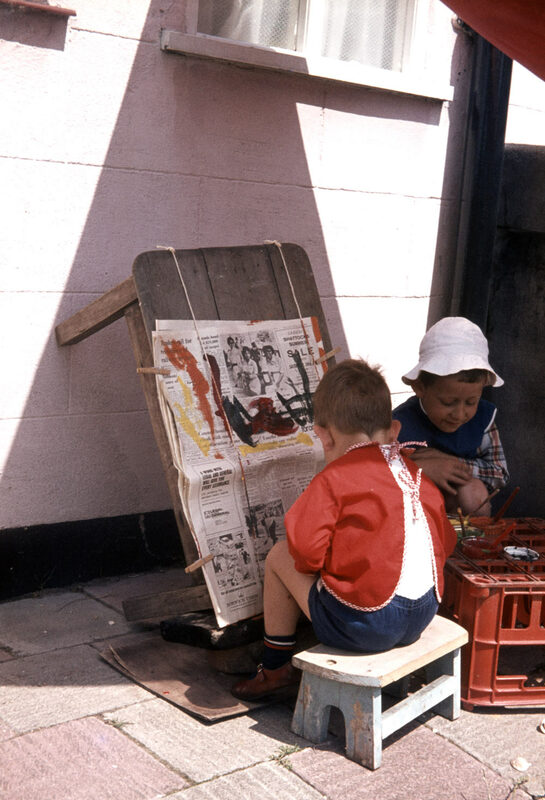 I am creating another underappreciated masterpiece while my brother looks critically at my choice of paint (note: this is not a recent photograph). The studio set-up here is frankly outstanding: good lighting, excellent ergonomics, plentiful materials, appropriate provision of protective clothing, and ingenious use of inverted milk-crate. All this, of course, is entirely due to my mother (whom I presume to be behind the camera). Her unstinting encouragement of all my artistic endeavours — both during the foundation-laying stage seen here, and later when I was making decisions about art and its priorities in the more adult world (a bemusing place I still find myself in now) — lasted throughout her whole life, and is delightfully evident in this picture. (Image scanned from colour slide).